This entry was posted in 365 Photo Project, Church, Flowers, Landscapes, People, Photography and tagged 365 project, Black & White, Boat, Books, Buildings, Church, City, Color, Fine Art, Flowers, Glass, History, Ma, music, Mystic, people, Photography, Scape, Seascape Boat, Thaddeus Miles, Tight, Urban, Vehicle, Wheels, Window. Bookmark the permalink. Nicely done… Like the antique finish and the symmetry of this photograph. 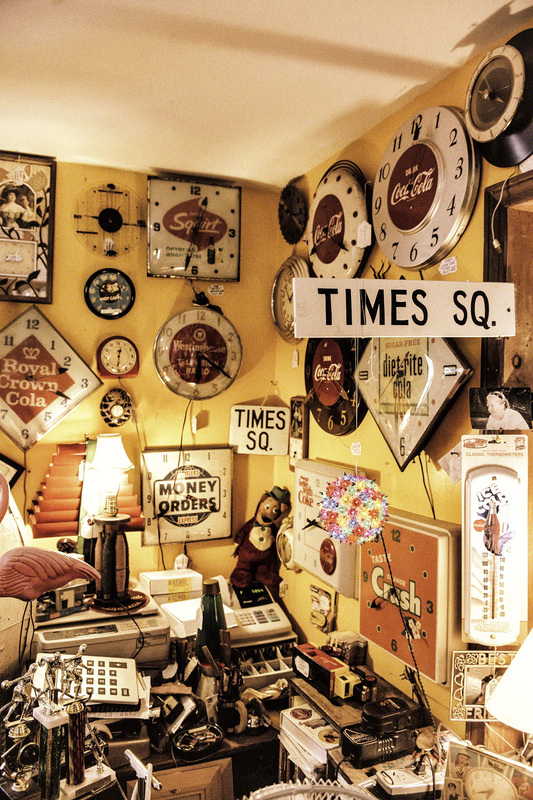 At first, your eyes are caught by all of the clocks, the Time Sq. sign, the thermometer, the hanging photo of a woman and so on. But, what has me is the light that the lamps and the hanging ornament cast over the clocks and on the ceiling. Wow, lots going on in this shot.